NEW YORK — Are architects egomaniacs whose deepest ambition is to build monuments to themselves and their rich clients? Or is architecture really a social service, like that of a doctor, performing the job of healing the world and making it a better place in which to live? It’s an argument that’s not going to be settled by a new exhibit at the Museum of Modern Art. But that show, which MoMA calls “Small Scale/Big Change: New Architectures of Social Engagement,’’ is proof that the ideal of a healing profession hasn’t disappeared from architecture. MoMA puts on view 11 works of architecture from around the world. All were built for people who are comparatively poor and underprivileged. Most are by youngish architects. There are five housing developments of one kind or another, two schools, a children’s art center, a museum, a park, a cable-car line. They’re presented in drawings, photographs, wall texts, and elaborate and often beautiful scale models. All of these works are modest. All were very inexpensive. But they do more than merely perform a social service. They are also distinguished purely as works of architecture. One of the architects is in Boston, at least part of the time. Hashim Sarkis earned his doctorate at Harvard in 1995 with a thesis on “The Design of Democracy,’’ and now is a professor and teaches architecture, landscape design, and urbanism at Harvard’s Graduate School of Design. Sarkis, a native of Lebanon, does most of his own architectural work in the Islamic world, although a couple of years ago he redid the façade of the Cambridge restaurant Oleana. His project at MoMA is called “Housing for the Fishermen of Tyre.’’ It’s a cluster of 84 apartments, filled with bright colors and fresh air, grouped around a shared courtyard in the ancient Lebanese city of Tyre. Sarkis talks about his housing by first talking about his students. Sarkis’s contribution to MoMA is an attempt to prove exactly that point. Like all the other projects, it was a collaboration of many people. Sarkis worked with the fishermen, who formed a housing cooperative, and with other agencies and financing sources. Progress began in 1998. It took a decade, interrupted by a war, a political assassination, and a frequent scarcity of money. All 11 projects at MoMA suffered those kinds of difficulties. Yet all emerged as memorable designs. A favorite of mine is what its architect, Anna Beringer, of Austria, calls a “Handmade School’’ in Bangladesh. The first-floor walls were built by a traditional local method known as molded earth, then were topped by a second story that’s a light open porch framed in bamboo. Nearly all the construction was performed by unskilled local labor. The result is a work of art by any standard. Another favorite is here in the United States, where there’s no lack of poverty, either. 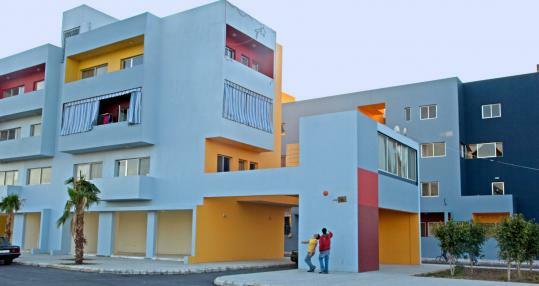 It’s a pair of housing clusters by an architect who has long been known for his work for less privileged citizens, Teddy Cruz, of San Diego. Cruz began not by designing anything, but instead by persuading the local authorities to revise the zoning rules in a Hispanic neighborhood. He loved the busy, crowded, lively world of people, homes, and shops that had grown up over time in the area, but he couldn’t replicate that mix because it was officially illegal. Only when the law was revised could Cruz design the kind of places he and his clients wanted. Cruz’s project and the others at MoMA do more than just provide architecture. They try to regenerate local economies by purchasing local materials and local labor, and by helping people develop new, marketable skills. In each case, both the architect and the client are also honing their skills in the practice of democracy. A few years ago, in a book called “From a Cause to a Style,’’ Nathan Glazer, the Harvard sociologist, argued that the modern movement in architecture began as a cause, with a powerful social vision. But over time it morphed into mere style-mongering, an activity not unlike fashion design. MoMA thinks so, too. “Small Scale/Big Change’’ is an attempt to reach backward in time, all the way back to the founding years of the modern movement in places such as the Bauhaus in the 1920s, to reconnect architecture with its early social idealism. “Small Scale/Big Change’’ is a statement, or maybe it’s a question, about the moral dimension of architecture. New Architectures of Social Engagement At: the Museum of Modern Art, 11 West 53d St., New York, through Jan. 3. Call 212-708-9400 or go to www.moma.org.